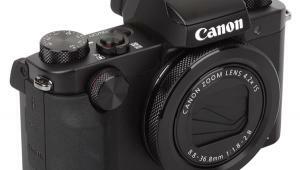 The FZ80’s built-in image stabilizer (Power O.I.S.) is a hybrid system based on optical stabilization and electronic stabilization and works with photo and video recording. It works very well, but has its limits when it comes to photos in the 800-1200mm range. In these situations we recommend using a tripod for sharp photos and jitter-free video recording. 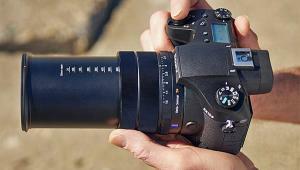 The Panasonic Lumix FZ80 is able to record 4K videos, thus offering Panasonic’s “4K Photo” system. It allows users to take an image series at 30 frames per second (fps) at a lower resolution for high-speed shots of subjects in motion. Due to a combination of an electronic and mechanical shutter system, it allows use of an exposure time of 1/16,000 second in electronic mode, while the maximum shutter speed is 1/2000 second in mechanical shutter mode. In addition, the Panasonic Lumix FZ80 allows use of a “Post Focus” function to take an image series and extract the image with the desired focus area in review mode. This function also allows for “focus stacking” to combine images in a focus bracketing series to attain a sharp image with a wide depth of field. 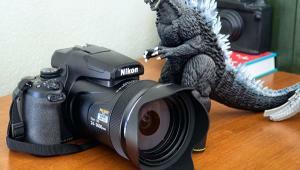 Using the “Post Focus” and “4K Photo” functions doesn’t permit manual exposure settings. In standard photo mode the camera offers P, S, A, and M modes. 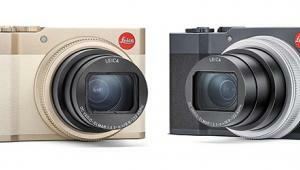 As a bridge camera, the Panasonic Lumix FZ80 offers an electronic viewfinder. This viewfinder has a resolution of 1,166,000 RGB dots. However, the viewfinder is small and offers a 0.46 scale factor (equivalent to a 35mm film camera viewfinder), thus is a little hard to focus manually. A large mode dial offers standard exposure modes (P, S, A, and M), scene modes, effect modes, a panorama mode, and a manual mode for video recording. The Panasonic Lumix FZ80 does offer focus peaking and a manual focus guide on the screen. Focusing manually isn’t very comfortable because the photographer has to use the control field to change the setting instead of a focus ring on the lens. The Panasonic FZ80 doesn’t offer any lens ring for zooming either and focal length changes are only allowed by using the “W – T” motor zoom lever at the shutter release button. In addition to the EVF, the Panasonic Lumix FZ80 has an LCD screen on the back (fixed/no swivel mechanism). This three-inch screen offers a resolution of 1.04 million RGB dots and is touch sensitive, so setting up menu parameters or choosing a focus area is very easy and comfortable. To switch between viewfinder and LCD, the photographer has to use the “LVF” button near the viewfinder ocular because the camera doesn’t offer an eye sensor. A parameter dial near the top, some function buttons, and a standard four-way control field all make intuitive handling of the new Panasonic Lumix FZ80. The Panasonic Lumix FZ80 offers quite a few control and user-defined function buttons. A setup dial handles exposure parameters, while the standard control field on the back is used for menu navigation. Additional “virtual function buttons” on the screen are available. The Panasonic Lumix FZ80 uses a built-in flash system and offers an accessory shoe for external flash. 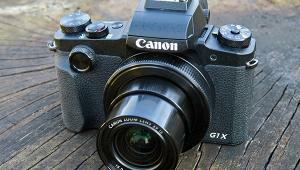 It supports flash systems with TTL metering. 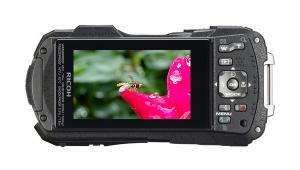 The camera offers an SD card slot for all SD card systems, including SDXC and UHS-I standard. The Panasonic FZ80 features a Wi-Fi module for use of a smartphone as a wireless remote control or to publish images directly in social networks. When used as a remote control the smartphone app (for iOS and Android) allows the user to change image parameters (shutter speed, aperture, ISO) very comfortably. Color: The Gretag SG test chart for the Panasonic Lumix FZ80 shows a nearly perfect white balance. All neutral gray patterns are located exactly in the center of our result chart. Most colors, like green, red, and yellow, show only minor aberrations to their given values, but blue nuances are shifted in a very extreme way. All blue nuances from bright to dark are highly saturated and shifted into the magenta-colored area. All neutral gray patterns are located exactly in the center of our result chart. Most colors, like green, red, and yellow, show only minor aberrations to their given values, but blue nuances are shifted in a very extreme way. Results from our tests of the video function are comparable. 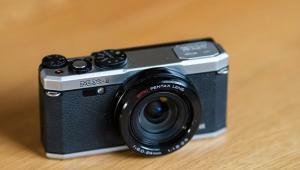 Sharpness: The Panasonic Lumix FZ80 offers a nominal resolution of 4896x3672 pixels. 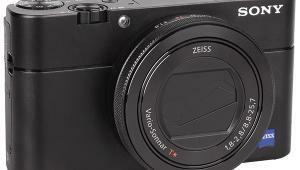 The ISO 12.233 chart was reproduced with 2,711 of 3,673 lines per picture height, a low result even for a compact camera system with a small image sensor. The extreme zoom lens creates compromises. A loss of detail is also noticeable in our test images, especially in corners of the images. 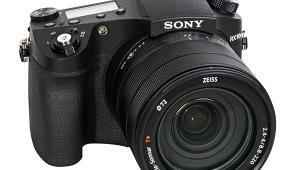 Image sharpness is on an average level for a compact camera system with a small sensor. The zoom lens of the Panasonic Lumix FZ80 causes additional reduction of sharpness in the corners of the image. Noise: Noise results of the Panasonic Lumix FZ80 prove that the camera uses a very small image sensor. The y-factor crosses the 1 percent line even at ISO 100. Using higher ISO speed settings, the y-factor stays on this level of about 1 percent because the camera uses a very intense anti-noise filtering system. By smoothing the images a lot of details become lost. These effects are already noticeable when images are taken at ISO 100 to ISO 200. 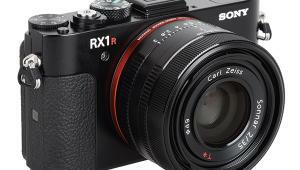 The dynamic range results are on a standard level for compact cameras with a 1/2.33-inch sensor. The FZ80 achieved a maximum of 10.1 f/stops, but the average dynamic range is about 7 to 9 f/stops. Color reproduction is very good. The white balance system caused a little cooler look, but reproduction of skin tones is very good. Some noise artifacts and anti-noise filter effects are already noticeable in this image, taken at ISO 100. 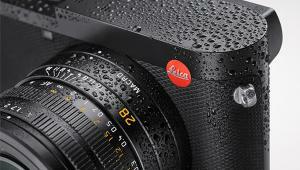 The camera records 4K videos with 30 fps and up to 60 fps in Full HD format. 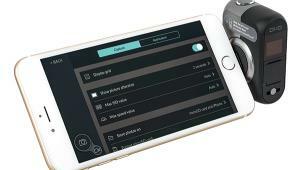 Using the mode dial on the top to switch into the manual video recording mode, use of standard exposure modes like P, S, A, and M can be chosen using the video menu on the screen. Manual setup of the ISO speed setting is allowed as well. Just like in photo mode, the photographer has to use function elements on the back to focus manually instead of using a lens ring. Focus peaking on the screen is helpful, but we missed a swivel LCD system, which should be a standard feature for current cameras with video functionality. The Power O.I.S. and the electronic O.I.S. systems are helpful when recording video. 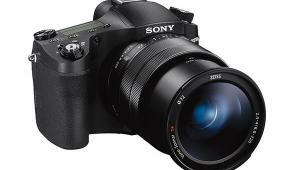 They help to record smooth videos when the photographer uses the Panasonic FZ80 with zoom lens settings between 20 to 400-600mm, but can’t prevent very shaky results when using higher zoom lens settings. 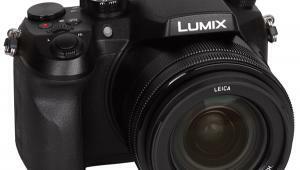 The Panasonic Lumix FZ80 performed extremely well in our resolution test when recording in Full HD mode. In this mode the ISO 12.233 chart was reproduced with 1,061 of 1,080 lines, which is an excellent result. In 4K mode the resolution result is only slightly higher: the camera recorded the test chart with 1,350 of 2,160 lines. Color results in video mode are comparable to color results in photo mode. The automatic white balance system worked very well and most colors show only minor aberrations to their given values. Blue nuances are extremely boosted/saturated. The dynamic range results are good: the camera achieved a maximum of 9.76 f/stops and keeps a level of about 8 f/stops up to ISO 800. Noise results are on the same level: noise artifacts are noticeable already at ISO 800 and get annoying at ISO 3200. 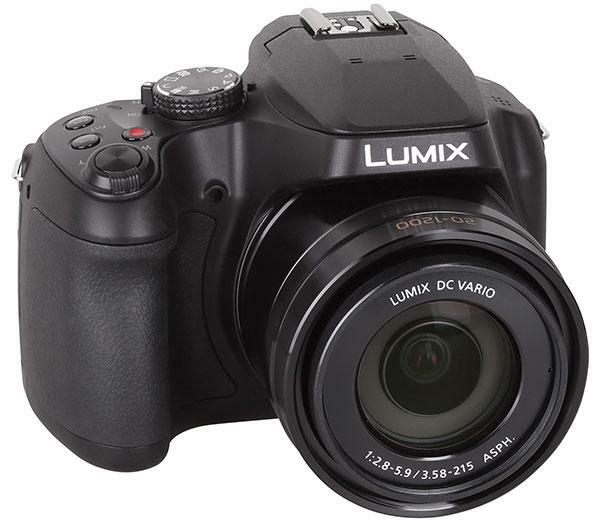 The Panasonic Lumix DC-FZ80 has a list price of $399. For more information, visit shop.panasonic.com.